This concluding comparison from Kenneth Turan seems to have spread across the internet into the mostly positive reviews of Spotlight. (And who’d a thought that in Oscar season 2015, Truth, the journalism biopic featuring Cate Blanchett and Elizabeth Moss, would be the stinker of the movies-that-come-in-twos.) To be sure, both All the President’s Men (1976) and Spotlight derive their gravitas from both (1) the real life substantive story (the Nixon administration’s cover up of Watergate and the Catholic Church’s cover up of pedophilia, respectively) and (2) the sausage-making process of old school journalism (Woodward and Bernstein of the Washington Post and the “spotlight” crew of the Boston Globe, respectively). 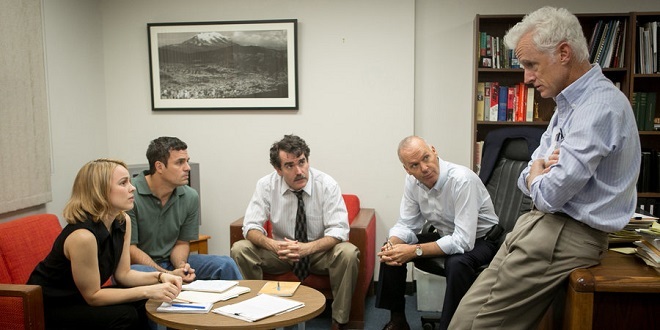 But while the performances of the ensemble cast of Spotlight run the gamut from competent to great, I am not so sure that the comparison holds up. With respect to dealing with the underlying subject of the drama, director Andrew Pakula and screenwriter William Goldman captured a key part of history in the moment (within a year of the next presidential cycle), which imbues All the President’s Men with an air of vitality and relevance even decades later. In contrast, Spotlight arrives in theaters more than 13 years after the true depth of the institutional abuse was exposed. As such, there are moments where we feel director/co-writer Tom McCarthy and co-writer Josh Singer’s need to overtly – and unnecessarily – school us about the scope of the story (even beyond the closing credits). And yet, we are already at a point where films like Calvary (2014) are exploring the after-effects of the scandal upon individual communities that once relied upon the Church. As a journalistic procedural, Spotlight is also more economically plotted for narrative palatability, and as a result, a lesser film. While the dynamics of the actual events portrayed in the two films may have differed due to the number of cooks in the kitchen, Spotlight nonetheless lacks the texturizing details that brought an authenticity and humanity to All the President’s Men. (For example, Rachel McAdams’ doorway-interview scene with an ex-priest may seem familiar, but it fails to capture the tension between professional ambition and skepticism that Dustin Hoffman managed to convey in the negotiation and re-negotiation with his sources.) To their credit, McCarthy/Singer bring a rather admirable thematic aspect into play – the role of the outsider, who is made to feel that he/she doesn’t belong, in ultimately bringing truth to power; but then they also manage to use a single conversation at a diner to drown us with explication about that aspect. And that exemplifies the most fundamental problem with Spotlight: a lack of subtlety that is presumably warranted by the level of outrage we are all supposed to feel. In McCarthy’s frame, the dual towers of Our Lady of Perpetual Help loom so large, and so frequently, over the modest homes of its Boston parishioners. And after Mark Ruffalo goes all Oscar bait-y in expressing his blue collar journalist’s agnostic blues (you know, to counter the notion that the media elite are all out to get organized religion anyway), we then see him, quite inexplicably, at a church on Christmas Eve watching the kiddos singing in the choir to serve as part of a bring-it-all-home montage. It’s all just a bit too much, a bit too late.